Enjoy Kask's lightest and most compact helmet with the Mojito. Like most top end helmets, the Kask Mojito uses in-mold technology to join the inner and outer polystyrene layers for improved shock absorption at a lighter weight. To further improve safety, Kask also uses their MIT Technology, which covers the outer shell of the helmet in a layer of polycarbonate. Technology in the helmet's shell means nothing, though, if it doesn't fit properly. The Mojito features Kask's up‘n'down adjustment system, which uses a unique double pivot to size around the head as well as up and down. The eco-leather chin strap and chin pad also help keep the helmet securely in place, and are hypoallergenic and washable. Additional features like 26 aerodynamically optimized vents to proper cooling, reflective decals for low light visibility, and removable and washable Coolmax pads make the Mojito worthy of practically any ride. The Kask Mojito Helmet is available in various colors. Claimed weight: 220 grams. Made in Italy. Head Circumference 18.125"-22" 19"-23" 23¼"-24½"
Love the helmet and reputation! My sunglasses hit the curve of the helmet behind the ears so couldnt keep it. I had a small crash on a commute this spring. Nothing too bad, but the helmet I was wearing had a pretty deep scratch in it. I decided I needed to replace it. Did some snooping on line, and decided the Kask Mojito was the perfect replacement. Extremely adjustable. Great fitting. I actually forget Im wearing it sometimes. It is my favorite helmet. Its a little bit more expensive than some helmets. But is head protection really where you want to be cheap? Worth every penny. Great fit an quality build. Replaced my Smith helmet with this one - was looking for a cooler better ventilated helmet. Very please with the Kask - Fit was great and the movable back made the fit spot on. The chin strap is heavier than I would like but getting more comfortable as it breaks in. Very cool in the heat of the summer compared to my Smith. I would buy another Kask helmet for sure. Product shipped on time and customer service was very helpful. The helmet fits as described and fits securely via twisting the back knob. I have rides with it 10 times now. Airflow is great and not hot on those sweltering Summer days. Use mainly for road riding and cyclocross. 1. The helmet's harness that hugs the back of one's head gets in the way of my sunglasses' arms. I resolved this issue by tucking the arms under the harness. Tuck them in before tightening the harness. The upside to this is that my sunglasses stay solidly in place. Overall, I'm enjoying the helmet. I can see item 1 as a slight concern when I have to, for some reason, remove and put back my sunglasses while moving. It's lightweight, safe, and fits me great. I like the leather chin strap and the helmet vents great. I keep it in the box when not in use to avoids scuffs and damage. Replace after crashing or a hard drop, as with any road helmet. Helmet worked great when I fell last month. This is the replacement! Fits great, the helmet is light and comfortable. The Kask Mojito helmet is light, stylish and very comfortable. I really like the way it fits and the controls help you dial in your head size. This is my first helmet from Kask and I really like it. It comes in a lot of different colors so they have something for everyone. When you are looking for your next helmet I would try this one. I can only say this helmet looks good and fits fantastic. It is so comfortable you hardly know your wearing a helmet. Have had it since i destroyed my old one in August. Waiting for the broken bones to heal but did not get a concussion! I received this helmet yesterday and looked it over carefully, it's flawless. Looking for to wearing this new Kask with my new road bike. I bought this helmet to replace my old Giro. It's lightweight, fits snugly, and feels secure. Seems well ventilated for hot weather. My only criticism is the plastic strap at the back, which holds the helmet in place, can be a tad uncomfortable. This same strap now keeps my glasses from staying in place, I have to adjust them constantly, as it seems to push them out. I think I'd go back to Giro for my next helmet. I use the helmet every day.Light and great to ware. Kask Valegro was my second try for a good fit and lots of ventilation.I also tried a Mavic Ksyrium Pro. The first was too round for a good fit on my head and the Mavic wasn't made as well nor did it fit as good as the Mojito. The Mojito has very good air flow ( I can add a cap in the winter) and is a light weight helmut. Hands down the Mojito was the one for me. Used for both road and mountain biking, helmet is well ventilated and has easy adjustability. The only drawback is you have to tuck your sunglass arms under the straps, they will hit the back of the helmet when worn outside of straps. This may only be true on a medium size as others here have noted. Overall very happy with this helmet. I have been planning on getting a replacement helmet and it went on sale. The helmet fits excellent is light weight and cool. The shipping and packaging was spot on. Super light weight helmet! Being in the military we want good functional gear, cycling is no different and the Kashmiri Mojito helmet was worth every dime spent! Over the years Ive had many road cycling helmets, Ill admit its my first Kask helmet, but certainly not my last. Im shocked by the fit & comfort with respect to the mechanics that enable the helmet to fit without sliding around. 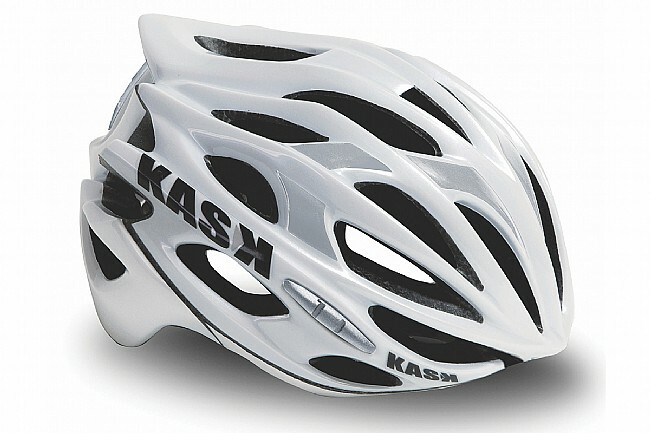 Ive already decided next helmet(color) will be a Kask! Very impressed with this product. of comfort and look good.